Feature and Follow Friday 6.7.2013 IT’S MY BIRTHDAY EDITION! Each week, in addition to a question to answer, one of the previous week’s participants will be randomly selected by each host for an interview (hence the Feature portion of the meme). This week’s featured bloggers are Rainy Day Reads and Read. Sleep. Repeat. Have you broken up with a series? If so, which one and why? Oh yes. Yes, I have. And since it’s my birthday, and no on can get mad at you on your birthday, I will spill all. 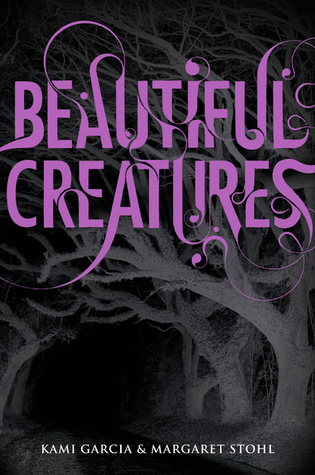 OK, that sounds a little more juicy than it really is, but the first series that popped in my head was Beautiful Creatures by Kami Garcia and Margaret Stohl. When I read the second book, that was it for me. A device that I can’t stand (even more than The Dreaded Love Triangle) is when a couple finally gets together, and in the next book, something tears them apart. Then, the entire book is one character doggedly chasing the other, just trying to find out what he/she did wrong. The other person won’t tell, and they are, of course, acting strangely. Boring Boring Boring. That kind of drama was old when they did it in some 50s comedy/drama. So stop. Unless you can be very, very convincing. But no. Just stop. I did not dare read the second book in this series, after the very negative reviews.. New bloglovin follower! And of course: HAPPY BIRTHDAY! Thank you for the wishes and the follow! Following you via Bloglovin’. Happy Birthday, my next caffeinated confession is all about break ups and DNF’s LOL I have book one of this series and of course I haven’t read it yet. Okay, you totally got me over here with the birthday note on your linky. So, happy birthday!! You’re actually the second person I’ve seen list this series as a break-up. I haven’t read any of the series yet, but I guess I don’t need to rush out and get it! I’m a new follower via BlogLovin’! I am on a thread about this book/movie on Goodreads, and it seems like people either love love love it or think it’s meh. The readership seems quite polarized! Thanks for the comment and follow! I’m following you via Bloglovin’. Thank you and thank you! Now following you via Bloglovin’. Hey just hopping around. Glad to read your choices it’ll make me think twice about the series you chose. Well, everyone has different tastes, so you never know! Thanks for the follow – following you via Bloglovin’. So, I’m a little late, but HAPPY BIRTHDAY! Yay for June birthdays! Do you hear that sound? That buzzing? It is our minds speaking together on the same plane (again!). Thanks so much! Thanks for the follow, too. Now following you via Bloglovin’.